Pigmentation and Post Inflammatory Hyperpigmentation - PIH is a common problem in dark skin types. This also includes patients of mixed backgrounds who have more darkly pigmented skin. Darker skin type people represent a significant and growing group of patients seeking aesthetic procedures. This is because of the increased awareness of safe, affordable aesthetic procedures. These procedures include amazing new lasers that are colour blind and are less invasive than previous generations of lasers. Yet special concerns have to be addressed when treating skin of color. People with darker skin tones are prone to certain skin problems. One of the most common is hyperpigmentation, or dark spots. These spots are caused by an insult to deeply pigmented skin, such as acne, a cut, or a disorder such as psoriasis. Melanocytes are very sensitive cells and can either stop producing color- hypopigmentation or produce excessive color in cases of inflammation- post inflammatory hyperpigmentation PIH which is most commonly seen in areas where acne blemishes heal, leaving a dark spot behind. These too will fade with time; however, it can be quite persistent. 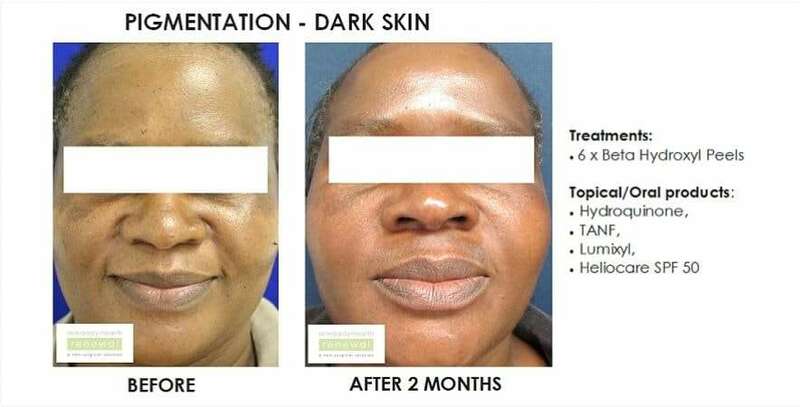 The traditional way to treat Post Inflammatory Hyperpigmentation or PIH has been to bleach the darkened pigment using hydroquinone based products which in South Africa is only available by doctors prescription. Still, despite best efforts with bleaching agents and exfoliation treatments, pigment from PIH can be stubborn and long lasting. There is a ‘something’ missing in conventional fading creams. Most have side effects. Is treatment for PIH in Dark Skin Types available at all Skin Renewal branches? 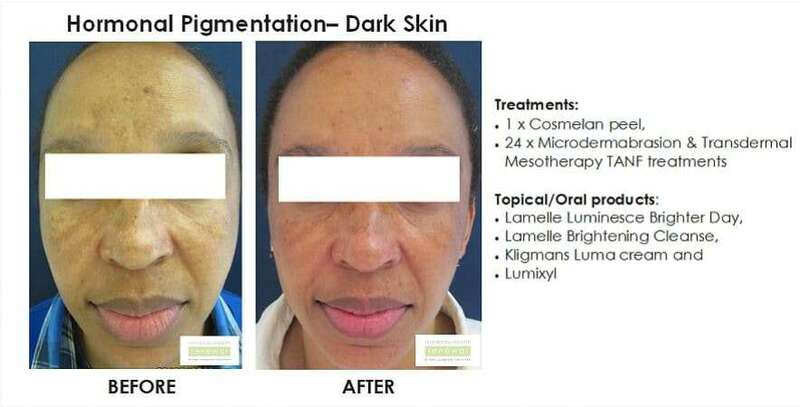 Treatment for Post Inflammatory Hyperpigmentation or PIH in black skin is available in Johannesburg, Sandton and Pretoria at the Morningside, Parkhurst, Bedfordview, Fourways, Illovo, West Rand, Irene, Brooklyn branches as well as in the Western Cape at Cape Quarter, Claremont, Constantia, Stellenbosch and Willowbridge branches and KwaZulu Natal in Umhlanga & Durban. How can one prevent Post-inflammatory hyperpigmentation PIH from forming in darker skin types? Skin Renewal is pleased to be able to offer the “something” missing in conventional fading creams. The following new topicals are available at Skin Renewal and can be used on ALL Skin types. At Skin Renewal we offer the gold Standard for pigmentation, Hydroquinone which is available on prescription. The use of HQ is strictly controlled at Skin Renewal. To prevent sensitivity from Hydroquinone, we include products which prevent the irritation that occurs with HQ in our prescription pigmentation corrective creams. We offer pigmentation serums with recent advances in pigmentation technology-pigmentation peptides in our home care products. This includes the Brighter Concentrate and Luminesce ranges by Lamelle. Brighter concentrate uses peptide technology to reduce melanin at eight points in its production, as opposed to just one point as with other traditional lightening treatments. Pigmentation ranges by top cosmeceuticals houses Neostrata are available at all Skin Renewal branches. In House topical brightening agents have been specially developed for Skin Renewal. The Skin Renewal brand includes traditional brightening products such as Kojic, Arbutin, Nicotinamide amongst others. Topical anti oxidants that protect against infra red A, a newly discovered deep wavelength which causes accelerated ageing and pigmentation, is also available at all Skin Renewal branches. At Skin Renewal it is mandatory that one of the home brightening products mentioned above be used routinely for 2 weeks on the entire problem area before any exfoliation treatment is done such as peels. A visit to one of our doctors who are experienced in treating skin of colour is mandatory before any procedure. The cost of the consultation will be redeemed after your first peel/treatment at Skin Renewal. Superficial peels. At Skin Renewal we have twenty different kinds of superficial peels on offer which improve pigmentation. With a series of peels you can quickly achieve substantial improvement in the uneven pigmentation, while making your skin look and feel softer, smoother, and more radiant. Please see our peel chart which indicates which peels can be done on your skin type. The Yellow peel is a full epidermal peel for PIH that is resistant to treatment with normal superficial AHA and BHA peels. Transdermal Mesotherapy with prescription Brightening products done straight after our peels improves the final result by removing deep dermal pigment. Cosmelan and Dermamelan mask treatments together with the home maintenance products offer superior results for resistant pigmentation. Laser Genesis: The epidermis renews itself every six weeks, by six months, any pigment from PIH is probably in the dermis. Traditional skin rejuvenation treatments such as peels, microdermabrasion and bleaching agents are not successful for pigment such as PIH that has leached into the dermis. That is when the use of certain lasers such as the long pulsed Nd Yag become effective to safely treat darker skin including skin type 6. The Laser Genesis procedure by Cutera gently heat the dermis, causing cavitation bubbles, which disrupt the unwanted dermal pigment, breaking it into smaller particles which are able to move upward to the epidermis where it can be easily removed with exfoliation. Our Brightening Intravenous infusions with brightening anti oxidants such as glutathione which work intracellularly to remove resistant pigment. An overall lighter and even skin tone can be expected. So far it has been an interesting experience doing the dermapen alternating with the peel/laser genesis. Carmen has been quite gentle with me explaining to me the process and what I should expect, of which I really do appreciate. The Cosmelan treatment is the best thing that ever happened to my skin. Pigmentation is almost gone, my skin texture is amazing and my skin looks radiant. My skin therapist was amazing, she followed up with me and answered all my questions. Cosmelan is amazing! This was my first laser treatment to any area of my face. Heather was very communicative and transparent about what I could expect during the treatment as well as in the coming weeks, which I appreciated greatly. Now to wait and see what the effect will be! My next treatment is in 2 weeks' time. Review -Brilliant service Brilliant Results! The experience is always breathtaking.One is given utmost attention and made to feel like queen .My therapist Bianca is friendly and reliable .I can call at anytime and she is happy to assist every time. From the first time I got to Skin Renewal Brooklyn, being black and a male not knowing much about beauty stuff, the staff made me feel at home. Their patience and attention to customers issues is top notch! I used to visit another practice but I don't think I well move to another one. Everybody is like family here now. Immediately you walk in your just greeted by a welcoming, conducive environment that makes you feel more relaxed with positive energy. Staff members very calm, knowledgeable, professional and showing interest and passion with their work. I always look forward for my treatment. The clinic is very clean and beautiful, it makes you feel very welcome.The staff are very friendly to everyone who comes through the doors. When they treat you, you feel more free than home. I do not regret coming through the door. They are also accommodating for people like me who talk to much and I appreciate it! Review -Brilliant service at Brooklyn! Had an excellent time, staff always welcoming. Doctor explained everything upfront and I am overall impressed. Review -My confidence is back and I feel good! I would like to take this opportunity to thank Dr Lestonn and the team for the good work they have done on my skin. My confidence is back and I feel very good and just over the moon that my youthful skin is coming back thanks to the products that have been recommended. I am looking forward to the total workout and the best results.